After our city tour and the Bratwurst sandwich, we came back on the ship around 1:00 to relax. The ship was docked right by the city, and it was no more than 15-20 minutes walk from the City Center. Around 4:00 we decided to go back out to explore some more of the city. Fellow tweeter and blogger @travellersoul76 went on the same trip a few months prior, and I was fascinated on the church she visited. So we found the location of the church, and made out that way. We took our time to check out the old city wall, made our way to the Dachauplatz, an outdoor shopping mall of sorts, that had big name stores like Hilfigger, Kors, L’Occitane and such. We were here on a Sunday, when the shops were closed. I could only imagine the pedestrian streets filled with shoppers, just like back home, except their store fronts are much older than my neighborhood. As we were walking, I spotted something on the floor. 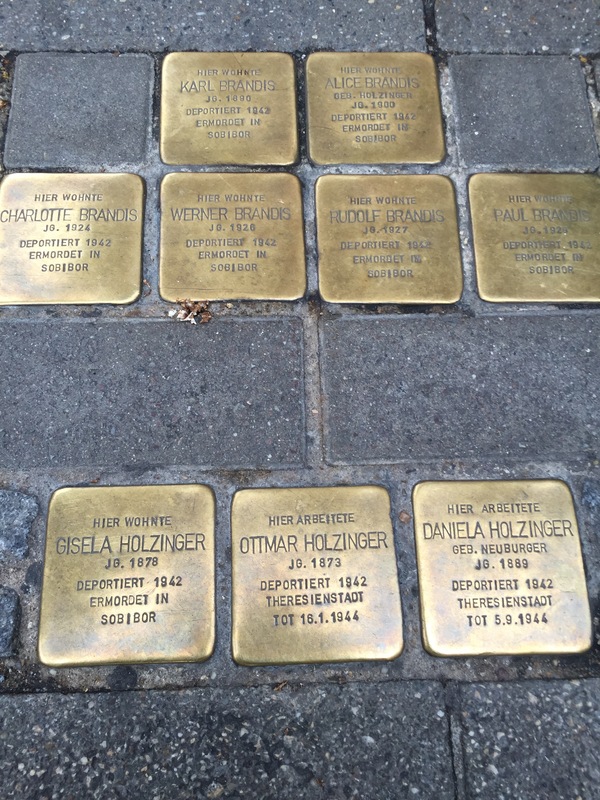 On one street corner, we came across a plaque on the ground, and realized it was a WWII memorial for some of the local Jews who lived and worked on that street, the date this person was deported, and the date the person died. These were people who were a part of this community, and taken away because of their ethnicity, not their nationality. As we walked the mall, we stumbled on an unassuming looking church, located across from Galleria Kaufhof (a department store). Yes, in the middle of a shopping area was this Kassian church, and inside was magnificent! Although it wasn’t the church that @travelingsoul76 stopped at, it was still a nice surprise. The inside was simply gorgeous! White washed walls with fresco paintings on the ceiling and altars dripping in gold. What a contrast from the drab exterior. The Kassian church wasn’t too far from the St. Stephen’s Cathedral, so we went inside. Unfortunately they were just closing for the night, but the guy did let us take one photo inside. However, take a look at how different these 2 churches are. The Kassian church is so humble on the outside, and magnificent inside. The Cathedral is foreboding on the outside, so…Gothic inside. I did not feel as welcome in the Cathedral as I did at the Kassian.. and yet these churches were just about 1 or 2 blocks away. It was 6:00 and the sun was going down. As we headed back toward the ship, we did find the church @travelsoul76 discovered, but inside was dark. They only light it when they have a service, and its only once a day. Getting late, we returned to the ship at 6:45, just in time for dinner. It was a long day, again. Tomorrow our stop is Passau, Germany.